currently I have a Hayward propane fired heater for a pool with a spa where the spa waterfalls over into the pool in normal heat and/or filtering. There is no waterfall when only in spa mode. I have a Jandy Aqualinks control and salt water chlorinator. I saw Raypak makes a heat pump for low humidity applications (6300 Ti LH). It has two coils and decides to run on one or two coils dependant on the outside temperature/humidity conditions. I would like to stay with Jandy since I have mostly Jandy equipment now. 1.) Since the Jandy has a higher BTU (137 vs 115) and Jandy states they already have a large "specially finned" coil, will the Jandy perform as well as the low humidity Raypak in cooler low humidity locations? I don't care if one costs a bit more to operate than the other as I am trying to ge the most heat output given the environmental challenge. 2.) since we will use the spa a few times where the outside temperature is 45-55 degrees on winter nights, should I also get a heat option to be sure the coils don't freeze and the unit continues to operate at the lower temperature? In these cool winter temperatures the humidity is usually about 45%, in the warm months where we may need to kick up the pool heat a bit and heat the spa, the humidity averages 20%. At any rate I am certain the cost of propane being near $4 a gallon and electricity at .114 KWH I will save a bundle switching over to a heat pump. Thank you for writing to me. You are right that Rheem / Raypak has heaters that they make for low humidity applications. They don't sell too many though. I took them off the web site because we distribute so few. They double up on the coils to get more air contact and thus more heat removed from the air passing over them. Then you have more heat available to put in the pool. Nothing wrong with that idea. The more humidity that is in the air the more heat you can take out of it. Humidity in the air (or water for that matter) is a form of heat. I think that it is over rated though. Gas guys, love to use the example that heat pumps don't work here because of the low humidity. That is a case of taking a small truth to justify a big lie. The difference between a day with 60% RH and a day with 20% RH might mean that you get 5 or 10% more heat on the higher humidity day. Not enough I believe to worry about. 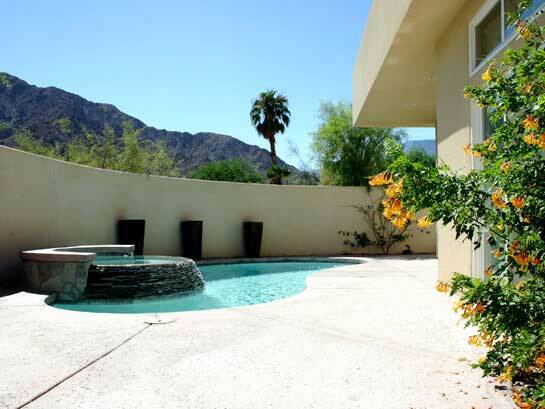 (We sell a lot of gas heaters, but there is a place for them, and it is not Palm Springs). 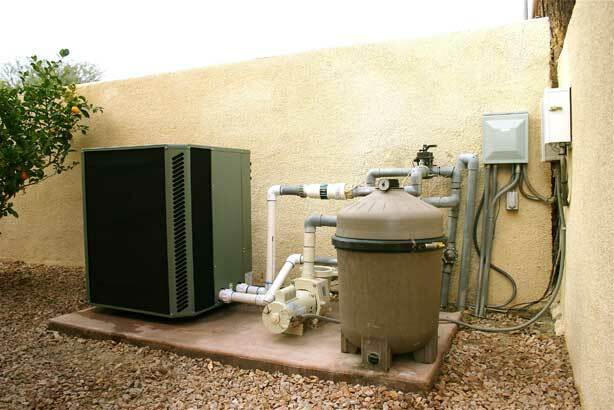 We have a great test heat pump in Las Vegas now that you can watch live on our site. We have camera and recording equipment set up. Now it is December and the pool is at 83 degrees. We have a Heat Siphon at that pool. It doesn't have a defrost, but does well into the lower 40's and might be a lower cost alternative for you. (not as reliable at low temperatures if you get higher humidity as it will frost up more) That is a case where low humidity works better on a non active defrosting heater. I will put a active hot freon gas defrosting heater on the pool as soon as some nice manufacturer donates one like Heat Siphon was kind enough to do. Some manufacturers use double coils as a standard feature to get the most heat and efficiency out of each pass of the air; like the big Jandy AE 3000 or The big Heat Siphon heaters. If you are going to use the spa regularly when it is 45 degrees outside then you should get a heater that defrosts with an active hot freon gas system. If not the heater will ice up and shut down until it gets into the 50's again. Propane costs too much to heat a pool or spa. You are on the right track. I have 1000 heat pumps from El Paso to Palm Springs with no complaints. Since you have a spa, get a heater high in BTU's so you will have to wait the least amount of time for it to heat up. If it was a choice for my pool, if I should get the Rheem 6300 low humidity or the 8300 with the power defrost then I would go with the BTU's of the 8300 TIPD. You might want to think about the Jandy heat pumps also with the defrost and the chiller feature. Some people where you live complain the pool gets too hot in the summer and want to drop it a few degrees. The chiller is nice in those situations. I hope that helps and that I hear from you soon. Thanks for the information. I WILL buy a heat pump but I am still deciding what to buy. I do a lot of research before I spend money! I see that your heat siphon is working well in your Las Vegas trial at temperatures below 50 degrees without a defrost option!? It will happen but will be rare that I use my spa (heat pump) at temps below 50 degrees. Therefore I wonder if I really need a power defrost???? Since I am shaded in the afternoon and my pool is small (no one will swim laps for fitness) I don't think I need a cooler. i.e. If the pool is 90 degrees the air is 100 and 90 then feels good. I do want a heater that will heat as fast as posssible given my desert environment. Which one, the biggest Jandy(135 BTU) or the biggest Rheem(137BTU) will have the coil surface area coupled with the mechanical necessities to produce the most heat in a humidity challenged area? I understand that this question is difficult to answer as Jandy or Rheem would not even share this information if it were even known. Thank you for writing back to me. If you don't think that you will get in the spa or pool when it is below 50 degrees than you don't have to get the defrost. Some people get a break on their power at night and like the defrost because it gets below 50 when the sun goes down but the next day it is in the 70's. The Vegas Heat Siphon doesn't defrost. It will shut down when it gets iced up and then it will have to wait until it gets warmer out the next day for the ice to melt. In a low humidity environment icing isn't as much of a problem as say Alabama in January. The big Jandy or the big Rheem are fine. You can't make a mistake. I can't imagine that you will notice much of a difference in heating ability as both have huge coils and are rated very high in the BTU area. If you do get the Rheem I would get the Power Defrost for $200.00 if you will operate near 50 degrees. The Jandy is digital and the Rheem is not. I do not know what that means being that the Jandy is digital and the Rheem is not....what are the pros and cons?? Also I have a Jandy One Touch Aqualinks control unit. Will it make any difference with the Raypak versus the Jandy heatpump in using the Aqualinks? Thank you for writing to me. The Jandy Aqualink can handle any different brand of heater. Since you have that system it doesn't matter if you get a heater with a rotary knob thermostat like your stove; that is what the Rheem has or the digital thermostat with a touch pad like the Jandy has. The reason it doesn't matter is that the Aqualink control system is digital and that is where you will now control the heater. I hope that helps and that I hear from you soon. I am buying the Raypak 8300 TiPD from you as it has the largest BTU of the two. I may need the power defrost for the spa on those winter nights so for an extra $200 I got it but don't feel I need a cooler. I look forward to swapping out my propane fired Hayward! I will let you know how the Raypak operates in the Southern California desert. That is great news. Thank you. We would love to see some photos when you are up and running. I'm here for you if you need anything else. The Rheem 8300 TIPD is now installed and running. Thank you for your valuable information and experience which helped me choose the right heat pump. I will attach a few photos for you to post on your site. The installation is in La Quinta, CA near Palm Springs. In 60 degree weather with 45% humidity the heater was raising my 55 degree pool water by two degrees per hour and on a separate test with the same weather conditions my spa water was raised by 18 degrees per hour. I am very pleased with the performance and look forward to not having those high propane bills! Thank you for writing back to me and the great photos and the temperature feedback. I love happy endings. I must say that is a clean looking installation. That is what I like to see. I attached your pictures below. As always we are here for you if you need us. i just got a jandy heat pump for my pool and it has the chiller option and defrost, but tonight i heard it making a strange noise and i checked on it and the sides are frozen solid. it is 50 degrees outside and the pool is 75 degrees. why would this happen? i turned it off. i guess i will turn it on in the morning. Thank you for writing to me. When it gets down to 50 degrees heat pumps start to freeze over. That is normal. Then if you have the one with the defrost option it will start to go into defrost at some point and will melt the ice. Let it run. If you don't think that it is going into defrost call for service and they will check it out for you. Hi, I am in Lake Havasu City, have a spa heated with a Jandy AE 3000. Instalstion is almost 2 yrs old. When first installed the heat pump worked great, I would get about 10 degrees rise per hour under most conditions. Last year during cold spells, I couldn't use the tub because the unit would go into air defrost mode and BTU output would drop to unuseable. Tech was called and after looking at the unit, he told me that it would not work below 38 degrees. Tonight, I wanted to go soak, outside ambient is 49 and the unit is going into air defrost. Any thoughts as to what is wrong?? The only way for sure to know what is happening is to have the freon checked. It looks like you did that. Sometimes those heaters will not run below about 50 degrees. Sometimes if is very humid they shut down earlier because they ice up faster. When the outside temperature is in the high 40's the heater is at about freezing. Low humidity is better when it is cold out but when it is warmer out higher humidity is better. (not by much though) You can measure the air temperature coming out of the top of the heater. It must be lower than the outside air when the compressor is running. If you are sure the freon is OK then you could also get a small cheap electric back up heater for the spa when it is too cold out too.